I noticed a box on the top shelf in the garage marked “Notebooks” and found one of my notebooks from 1999, in which I wrote about the Sunset Station concert in Vegas that year. I went with my best friend from high school, who I will be going to the concert with this year in March. “Only pissed off one chick while making my way to the front. She stood stiffly with her elbows in my sides. But woman with big hairspray-smelling long curly hair stood in front of me so I had to lean to the left. Tore a leaf off a bouquet he threw but shared with Beth and another girl who couldn’t reach. After concert, waited a bit but no “meet and greet” announcement (missed him at Tower Records earlier in day). To be with you till the end. I would have had no idea what that meant. After I first moved back to Phoenix, I signed up with a couple of temp agencies while I figured out what I wanted to do next. One was clerical and the other was food service. After working in a corporate environment for four years, the food service jobs were a nice change. Many of these jobs involved selling beer at concerts, which meant I got to listen to live music while I served beer or collected money for the drinks. I got to hear bands that I already liked, such as Dave Matthews Band and Sting (since we had to be there before the show, I even got to hear Sting do his sound check, which was really cool; he was on stage and I watched from rows above in the Mesa Amphitheater). And I saw bands I wouldn’t have seen on my own – such as Black Sabbath, Slayer Primus and other heavy metal bands in OzzFest (after the beer tents closed, we were allowed to stay and watch the band. I stayed to hear Ozzie Osbourne play with Black Sabbath since it felt legendary, but left pretty quickly after people started lighting small fires on the lawn). Most of my clerical jobs were pretty boring, although I did meet some nice people. Other food service jobs included working in retirement facilities, sporting events, nursing homes and even in a high school cafeteria. Being in all these new situations created lovely fodder for writing and I’d spend lots of time writing in notebooks about the different people I was meeting. Perhaps to develop into characters for a future screenplay, who knows? I also spent those first few months writing songs and performing them at open mics at various coffee shops around town. There were a small group of people that would attend the different open mics – both talented musicians and others who just liked to listen; they were all a supportive bunch. I wrote lots of songs during this time – more like lyrics with melodies accompanied by the few guitar chords I was able to play. I’m still in Phoenix – married for nine years and we have three young boys, a dog and a goldfish. I work as an editor and writer at a local community newspaper, which I enjoy very much. 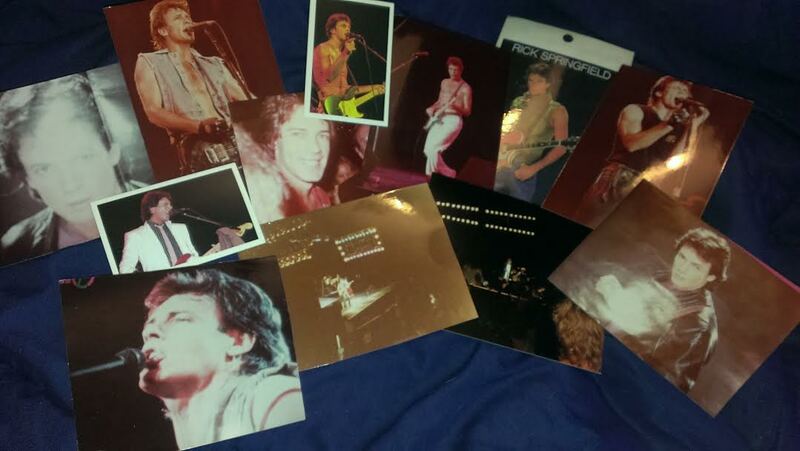 (The framed picture of Rick Springfield is still on my bookshelf, my husband doesn’t mind). Then one day at work, I’m checking the KAET listings to confirm a TV show listing in our calendar and there on the bottom of the home screen is a video of Rick Springfield. Hmmmm.. I make a mental note to check it out at home later that day. I remember a couple of evenings later (life is kind of chaotic around here…) and make time to watch it. He has a new book? What? A novel?! Then midway through the interview, he mentions his autobiography. What autobiography? Where have I been?! Time for some Googling. I learned that this autobiography “Late, Late at Night” came out FOUR years ago! (The year my youngest son was born – that time with a 4-year-old and a 2-year-old a newborn are kind of a blur). I also learned about the documentary made by some of his fans, “Affair of the Heart,” which somehow made me feel a little guilty – here he has two published books that I didn’t even know about and other fans made a whole movie about him. And these fans also go on Rick Springfield cruises, all-inclusive Rick Springfield vacations at resorts and tour around the country to see him in concert. And that’s not even to mention that he’s put out a few albums, with songs I’ve never heard, since I’d last checked in. There was a time when I knew that Rick Springfield and I would be married – only in a way that a 13-year-old can be sure of such things. I had a rich fantasy life during those years. One year, my friends and I camped out in front of Diamonds department store in Mesa to buy Rick Springfield concert tickets. We weren’t the only ones and our seats weren’t great but I was convinced that he looked me straight in the eye through my binoculars at least twice. I think I still have the concert T-shirt in a box in the garage. In ninth grade, I took a guitar class and the girl who sat next to me in class and I would trade posters from our 16, Teen and Tiger Beat magazines – she’d give me her Rick Springfield posters and I’d give her my Eddie Van Halen posters and we’d discuss our plans to meet them.